Stock up: chicken and salsa. I truly love to cook. But I don’t love to cook every day. 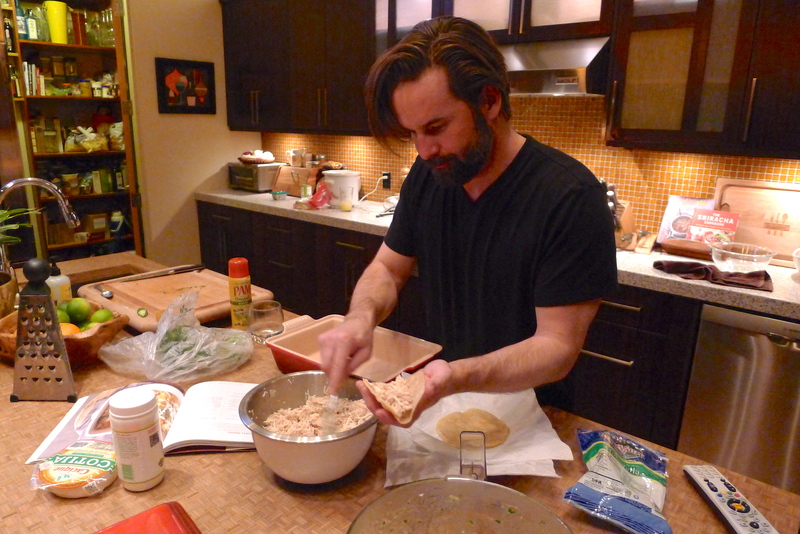 I like to dog-ear simple recipes that will feed us for a few days (or stock the freezer for those lazy nights). 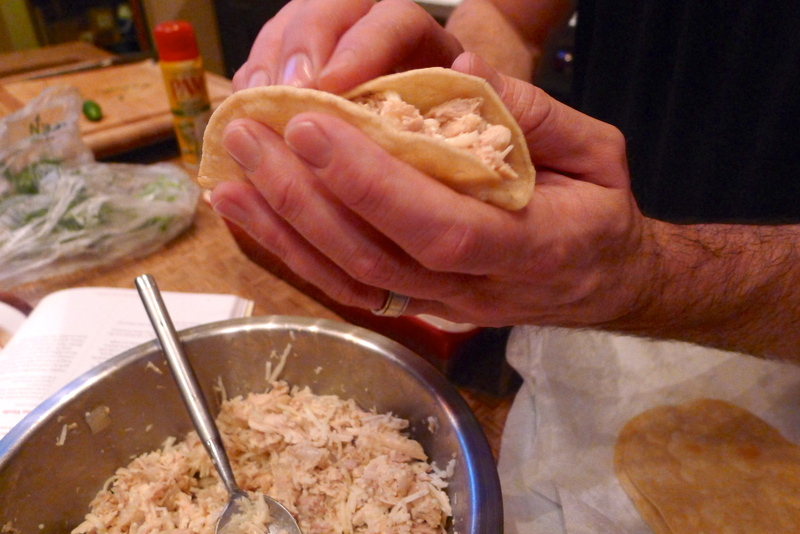 During our Superbowl date in the kitchen, John and I discovered two delish things that can be made ahead of time and will last for more than a couple of meals: slow-cooked shredded chicken and tomatillo salsa. 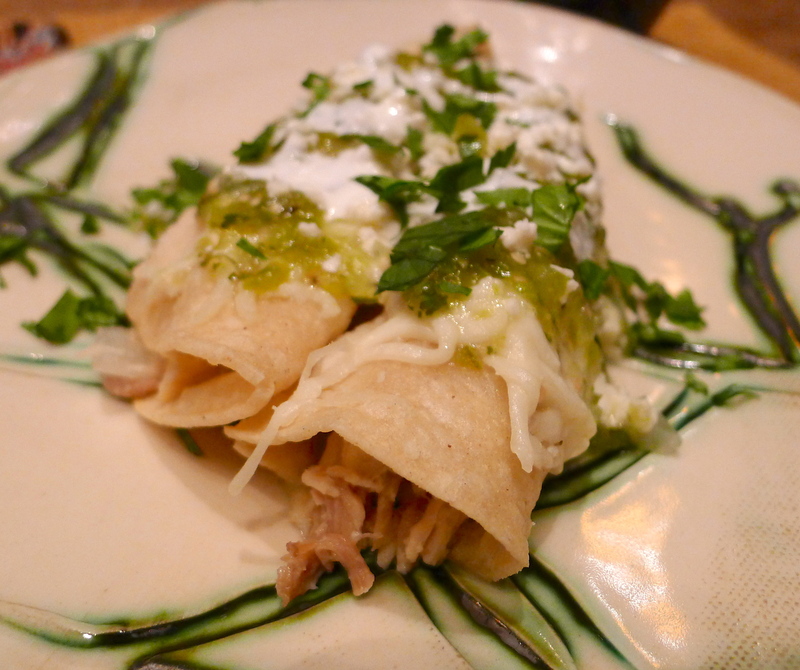 The recipes were part of a larger process to make Enchiladas Suizas. 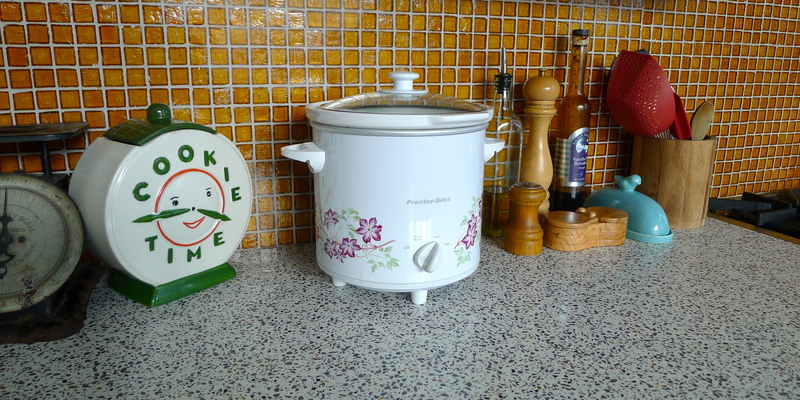 I’m consistently shocked at how simple crockpot cooking really is. 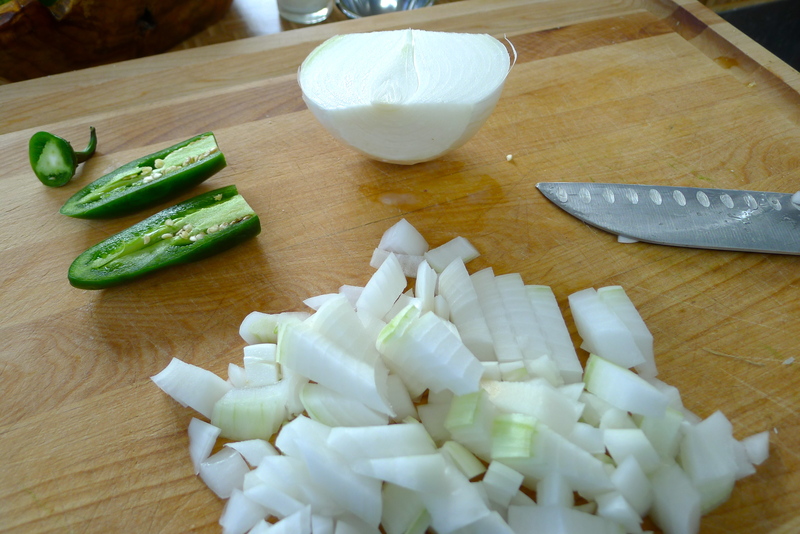 Before John and I went on our hike, I quickly chopped up half of an onion and sliced a jalapeno. 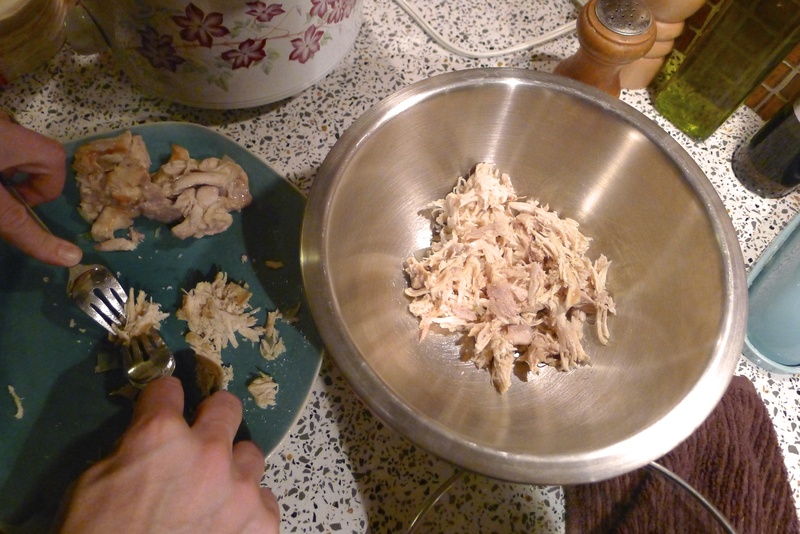 I placed about 2 ½ pounds of chicken (boneless, skinless thighs and breasts) into the crockpot, followed by the veggies. A generous pinch or two of salt and a cup of water- that’s it. 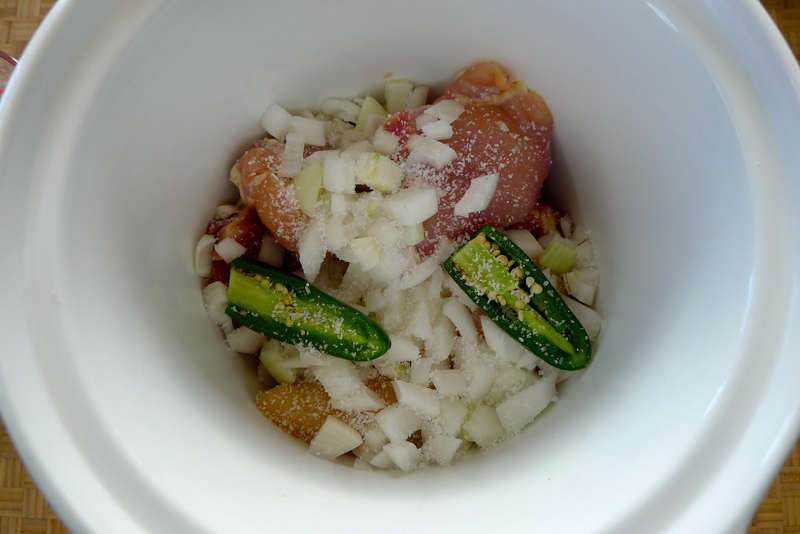 Aside from a gentle stir every now and then, we left the crock alone for four hours on low. The result was tender, moist, and very flavorful chicken. 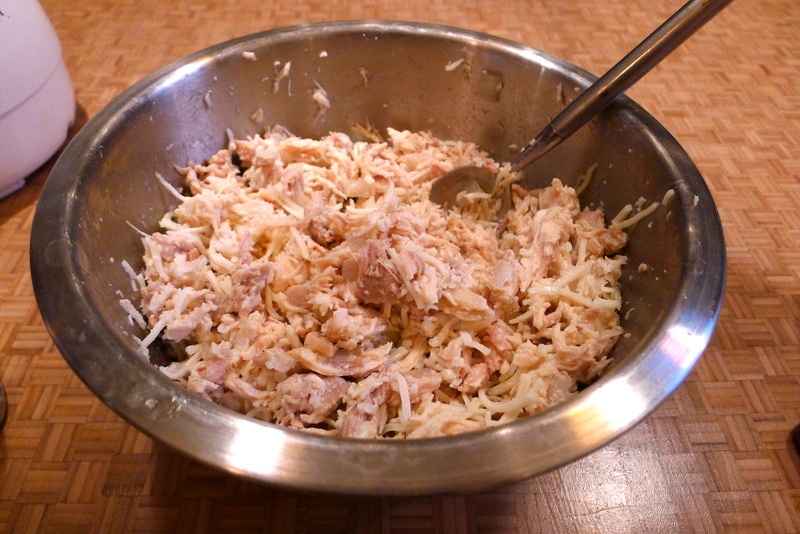 John shredded it up, spooning the onions and a small amount of the liquid from the crockpot into the meat. We some of it for the enchiladas, but had leftovers for burritos, quesadillas, chicken salad, sandwiches, wraps… Delicious! How easy was that? And who doesn’t keep salsa in the fridge at all times? 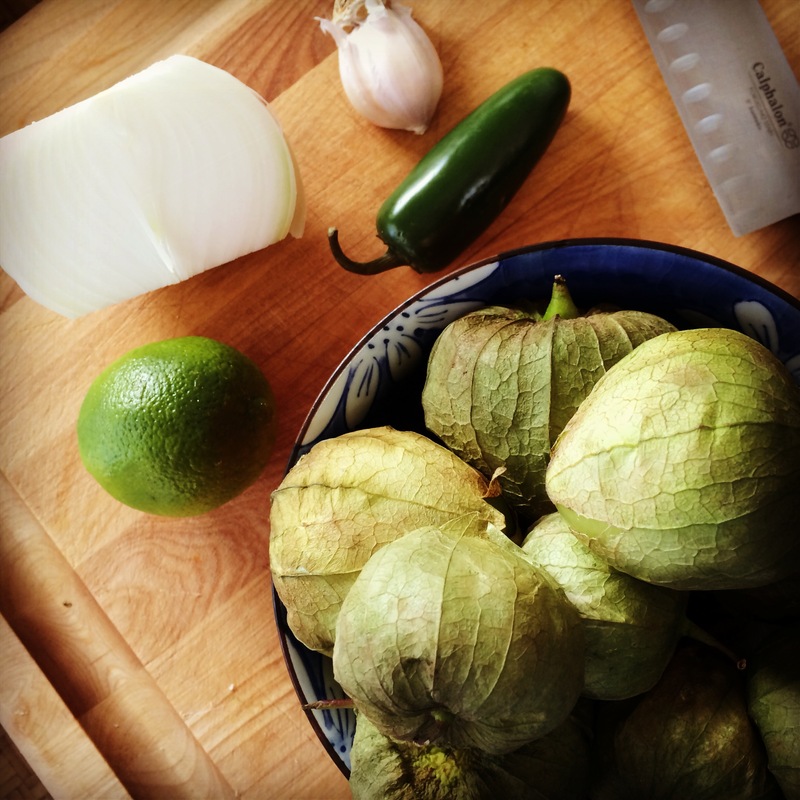 Homemade is always better, and this tomatillo salsa is bright, fresh, and tasty- and a cinch to make. 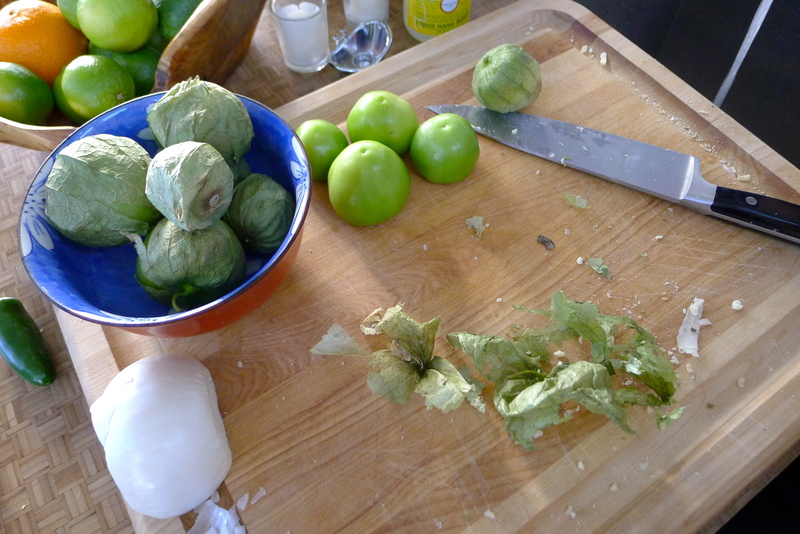 The hardest part is peeling the tomatillos (thanks, Hubby!). 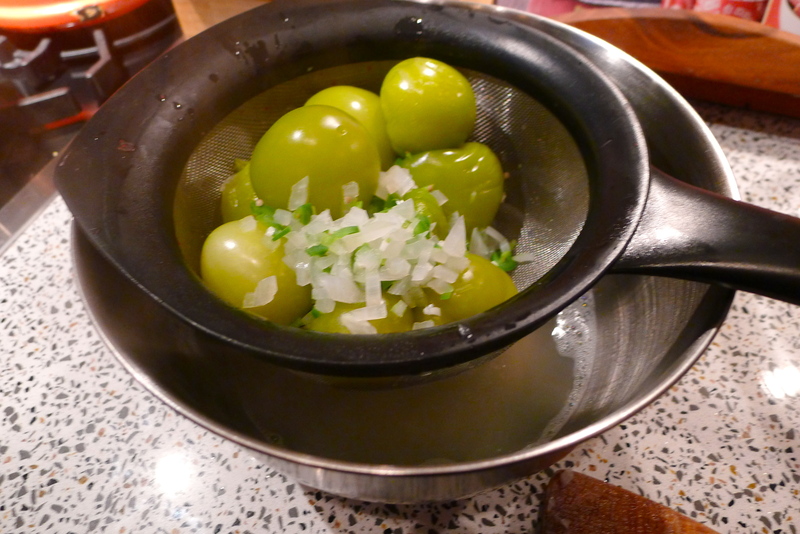 I placed the peeled tomatillos right into a saucepan, whole. 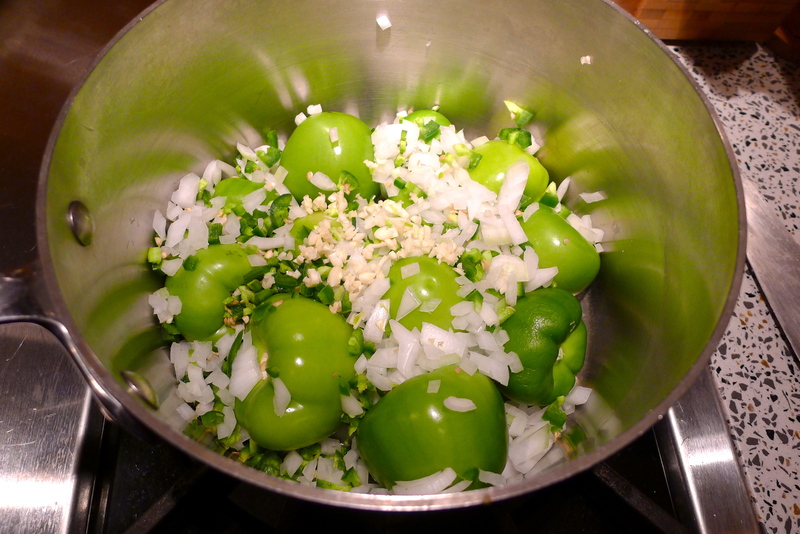 I added half of a chopped onion, chopped jalapeno and Serrano peppers, garlic, salt, and pepper. 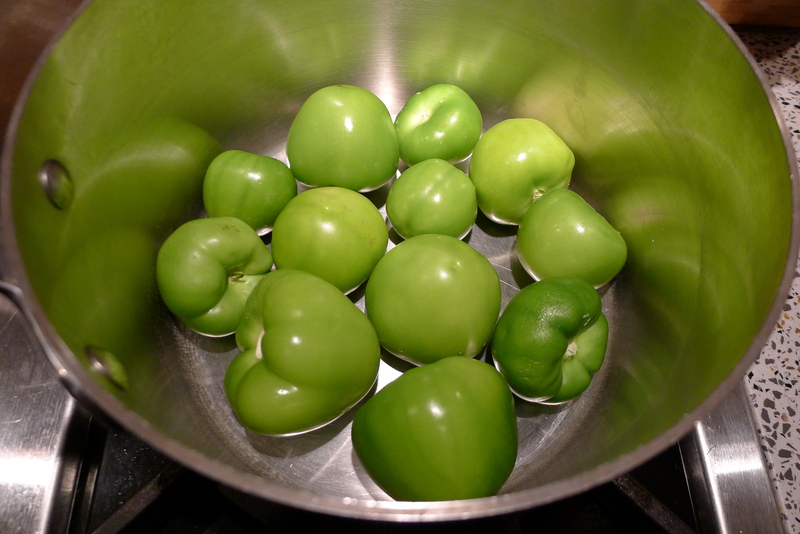 With just enough water to cover it all, I simmered the yumminess until the tomatillos were soft. 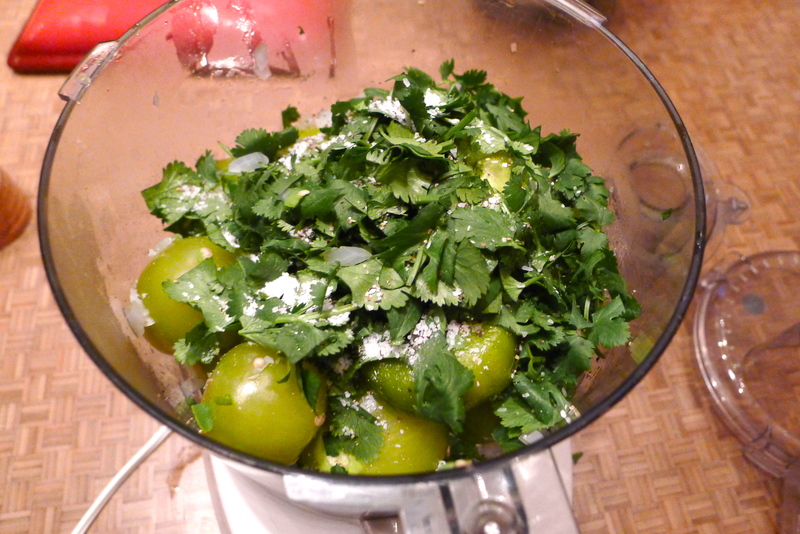 Next, I drained out the liquid and poured the tomatillo mixture into a food processor. 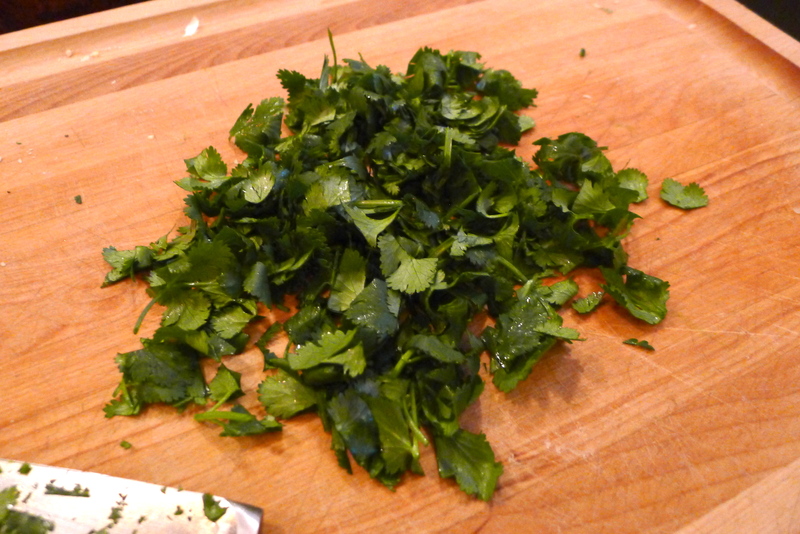 I tossed in a large handful of roughly chopped cilantro and some more fresh jalapeno (we like it hot! ), and blended it all together. After adjusting the seasonings to taste, the salsa was done. Piece of cake! We assembled our enchiladas by filling corn tortillas with the chicken mixed with cheese, then rolling them into a casserole dish (seam side down). 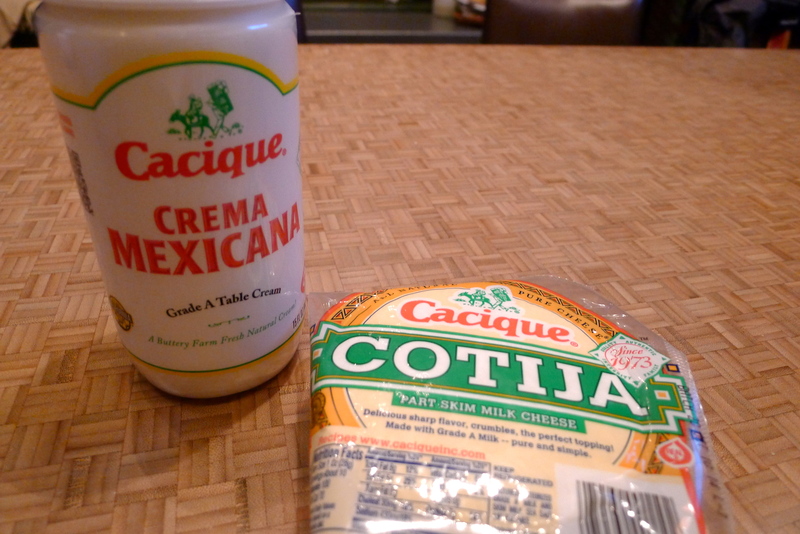 After generous sprinkling of more cheese, they baked in the oven at 350 degrees for 15 minutes or so, until the cheese was melted and the tortillas were starting to brown on the edges. We topped our enchies with the fresh tomatillo salsa, crumbled cojita cheese, and a drizzling of Mexican crema. Superb- and another reminder that simple is best. 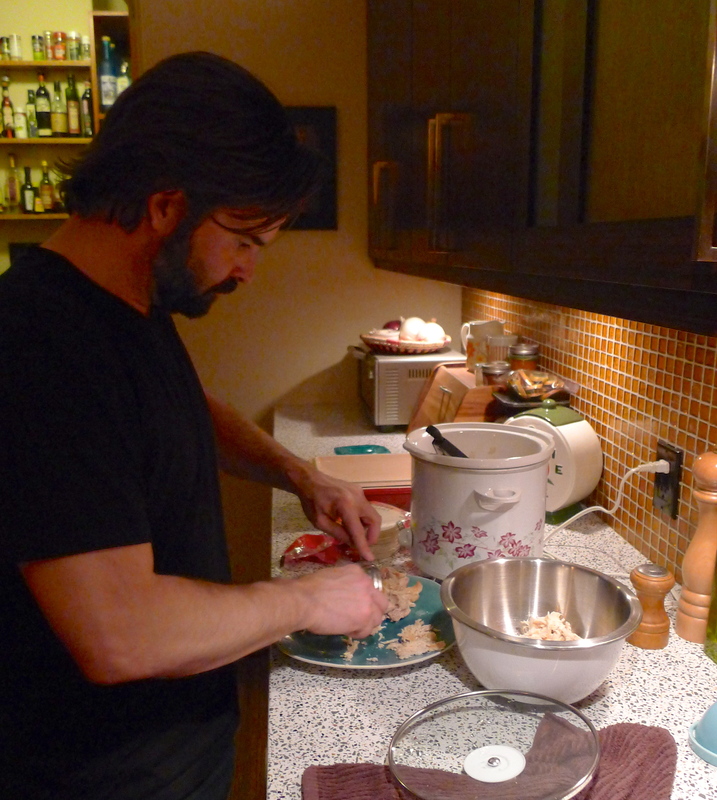 Not only was our dinner delicious, but our (minimal) efforts paid off later, as well. John made his employees jealous with tacos for lunch at work using the leftover shredded chicken, and we have a stash of tomatillo salsa in the freezer. Score! What are your favorite simple, make-ahead recipes? Share with me! 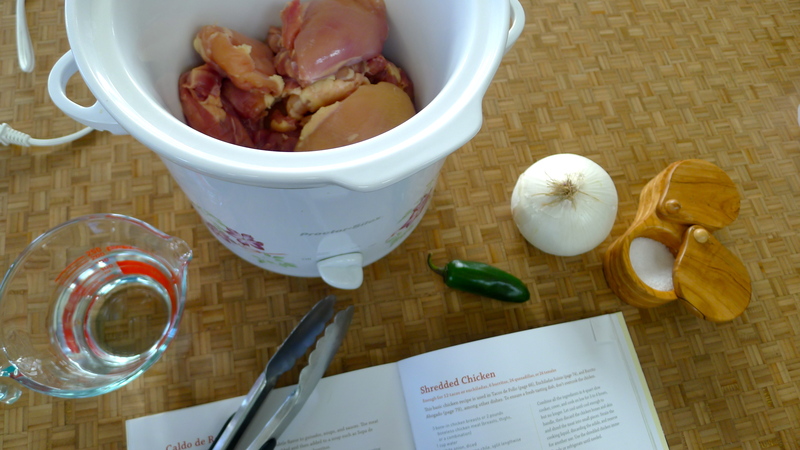 Combine all ingredients in a 4-quart crockpot. Cover and cook on low for 3-4 hours. Let cool enough to handle and shred the meat using two forks. 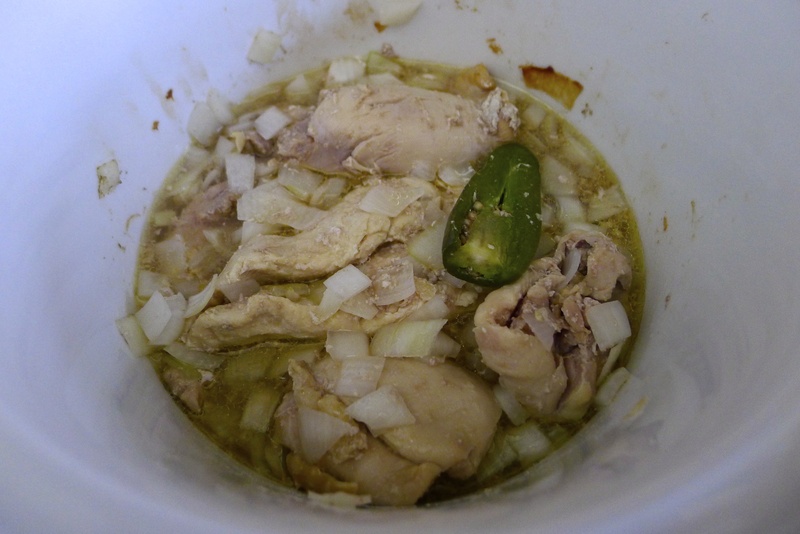 If you like, add the onion and a spoonful of the cooking liquid into the chicken for added moisture/flavor. 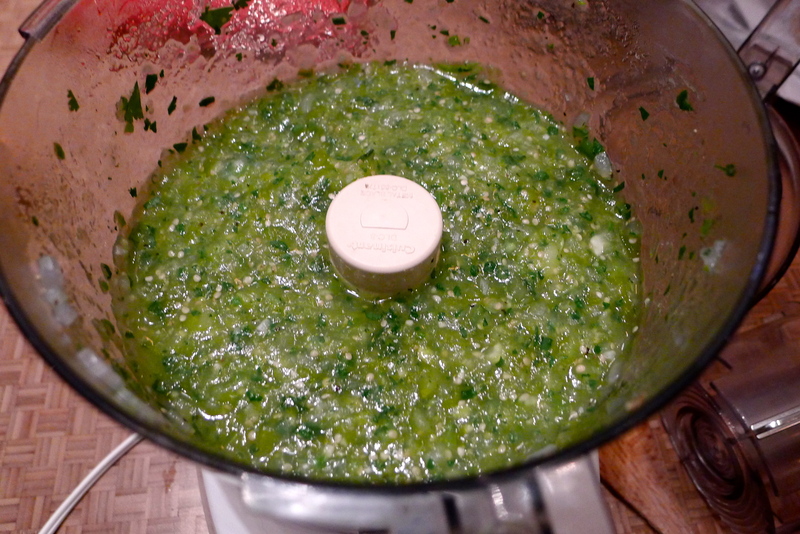 Use for tacos, enchiladas, burritos, quesadillas, tamales…you get the idea. Yum! 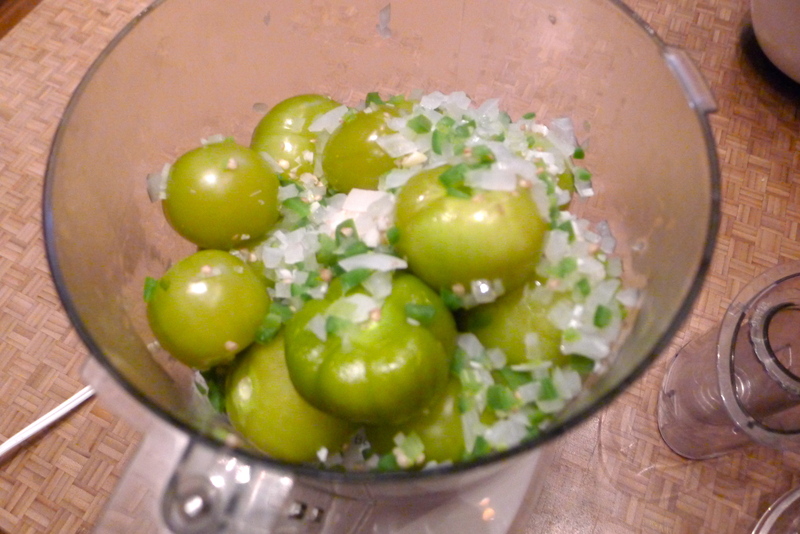 Combine tomatillos, onion, jalapeno, and garlic in a small saucepan. Add water to cover and bring to a boil. 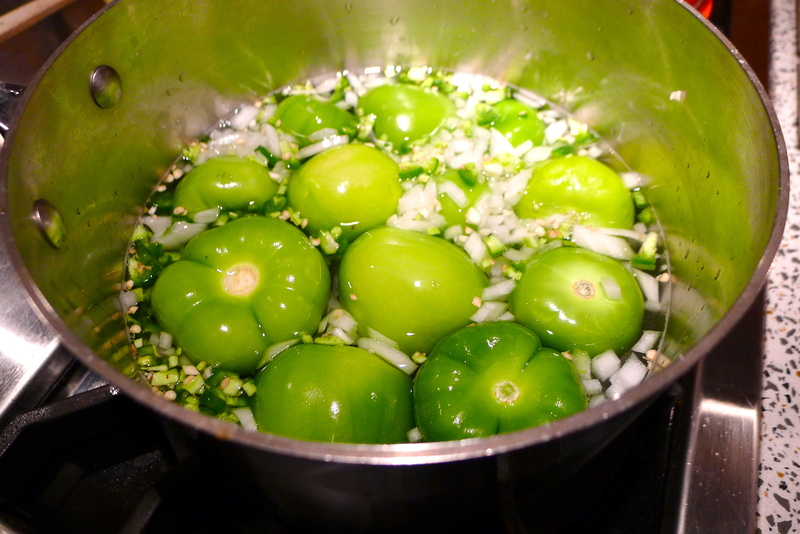 Lower heat and simmer until tomatillos are soft, about 15 minutes. Drain the vegetables and transfer to a blender or food processor. Puree until smooth. 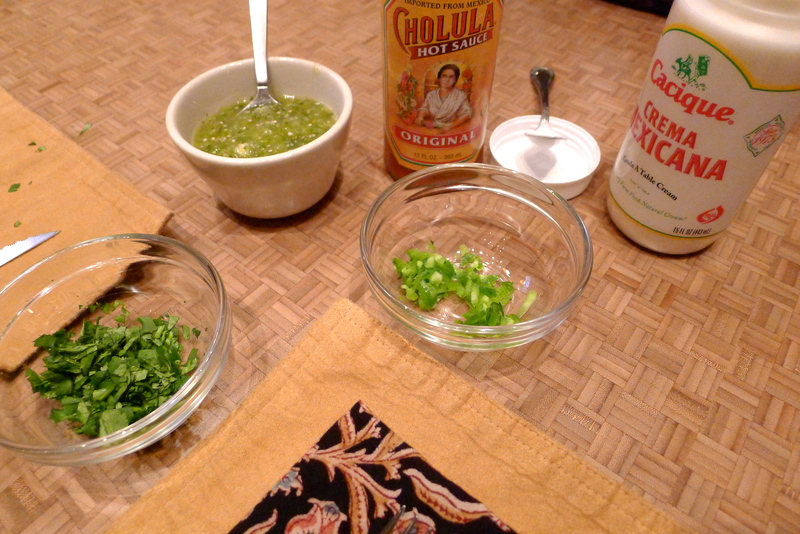 Add the salt, pepper, and cilantro and puree again. Adjust seasonings and spoon salsa over everything. Yum! 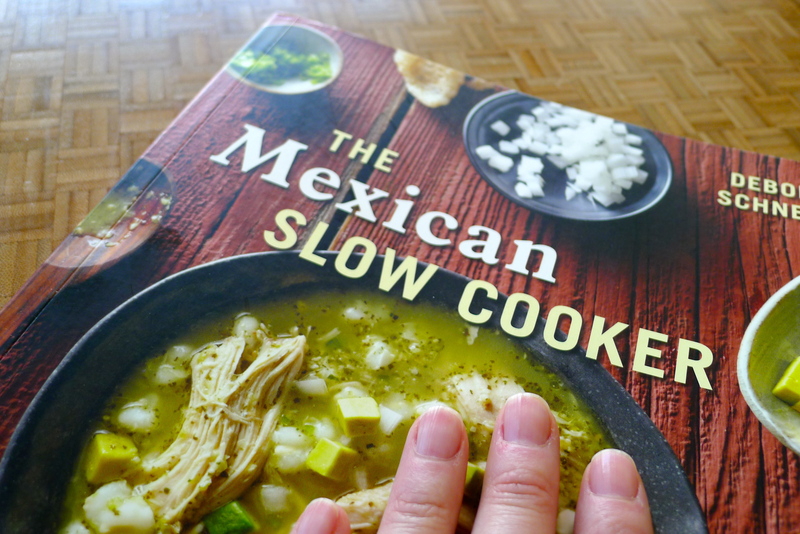 **Both recipes adapted slightly from The Mexican Slow Cooker cookbook by Deborah Schneider. One year ago: The in-between moments are the good stuff.